Bail Bonds Oahu: Should You Pay Your Own Bail? Does It Make Sense to Pay Your Full Bail Amount? One of the questions that we get asked the most often at Wanna Get Out Bail Bonds is if a person should pay their full bail amount to be released from jail. The truth is that it’s a rather complicated subject that depends on a number of different variables. Although there is not a one-size-fits-all answer to this question, our goal is to provide our clients with the best information possible in order to ensure that they’re able to make the decisions that work best for them. No matter the situation, we strive to offer advice that is both clear and concise. We know that you’re not an expert, but the good news is that a trusted bondsman from our agency would be glad to talk you through any questions or concerns that you may have. You may have seen elsewhere on our website that we offer free bond advice, so whether you have a question about the information that you see in this post or something else entirely, don’t hesitate to call us because we’d be happy to chat with you to get you the information you need. Anyway, back to the topic at hand; does it ever make sense to pay the full amount for bail and leave a bond agency entirely out of the picture? As we mentioned above, there’s a lot to consider. Fortunately today’s post has the insight you need. Keep reading to learn more! What Does the Situation Look Like? At the end of the day, the truth is that every situation is going to be a little bit different. Depending on the nature of the crime, the total amount to post bail can be rather low or particularly high. Some other factors include if you have been arrested or convicted on other charges in the past, if you have a troubling criminal history, if you have skipped bail in the past, and even how old you are. Another thing to keep in mind is that bail amounts here on Oahu are likely different than they are in say Maine or Colorado. Probably the biggest factor when it comes to posting bail is whether or not you can afford it. Let’s set an example: you were arrested for a crime and your bail is set at $5,000. If you have that much money in your bank account then you can pay it and you’re free to go. If you don’t have $5,000 sitting around? That’s where we come in. Generally speaking, many bail terms require you to pay us around 10% of the total amount of your bail, then we’ll pick up the rest of the cost. In other words, on a bail amount of $5,000, you’d pay us $500 to secure your release. Another important thing to consider is that even if you do happen to have the money you need to post bail, will it cause problems down the road? There is a lot to think about. For example, if you use every last dollar in your bank account to post bail, will you have the money that you need to pay your bills? 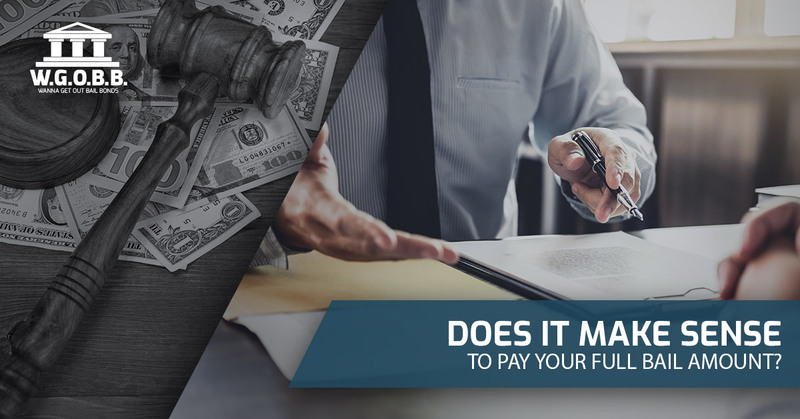 Will you be able to pay for a lawyer? These are all crucial components to consider when deciding if you’d rather pay for your own bail or enlist the help of a bondsman. At the end of the day, the decision is up to you. If you’re on the fence about it, keep reading to learn a little bit about what the team at WGOBB can offer. Searching for a Bail Bond in Honolulu? When it comes right down to it, the truth is that not a lot of people can afford to pay their own bail. Not to worry, however, because if you are in need of a good bondsman in Honolulu, we can help. Our team offers up to a 20% discount for accounts that are paid in full. With no collateral needed for most bonds, we make it easy to get the help you need without having to make sacrifices. We also offer zero interest and flexible payment plans and we’re glad to take credit cards. Freeing yourself up to take care of the things you need to take care of is never a bad idea. While it’s important to consider your options on your own, you should also know that we offer free bond advice (and we accept collect calls as well). With service 24 hours a day and 7 days a week, there’s always someone here to lend a helping hand when you need it the most. We know that these situations can be stressful. Knowing what to expect can make all the difference in the world and it’s our goal to help you prepare for what’s coming next. Our team assures complete and total discretion at every step of the way, so no matter the situation that you find yourself in, you can rely on us to take great care of you, treating you like family in the process. Whether you’re facilitating your own release or bailing out a loved one, we are here to make the process a little easier. Contact us today to get the help you need from the team you can trust.